The first that we present here is an article published in Materials Science & Engineering C - Materials for Biological Applications, and a collaboration between ICMAB, the Istituto Italiano di Tecnologia and the University of Barcelona. The paper focuses on anti-cancer drugs, which are prepared combining freeze-drying and supercritical CO2 foaming. After performing the experiments in a systematic order, following a factorial experiment design, the best temperatures, drug amounts and depressurization rates needed to obtain samples providing a sustained drug release for several days are found. This anti-cancer drugs may be of great interest to develop materials for tissue engineering and sustained release applications. The second publication is published in ACS NANO, and is from researchers from the NANOMOL group at ICMAB and CIBER-BBN, the Kavli Institute of Nanoscience at Delft University of Technology, and the IQTCUB at the Universitat de Barcelona. Fast, reversible, and local control of magnetic properties of molecular systems is sought after as a potential path for molecule-based spintronic devices and quantum information processing. 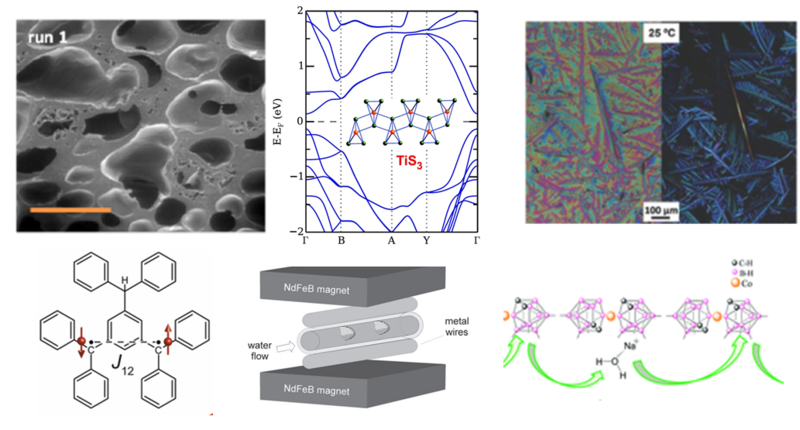 In this study, they embed a magnetic electroactive molecule in a solid-state junction and juse the gate electrode to chage its magnetic properties through a form of spin-electric coupling, using an all-organic radical molecule. The third one is publlished in Cement and Concrete Research and with researchers from ALBA Synchrotron, Cidade Universitária in São Paulo, Universidad de Málaga and ICMAB. Aluminum hydroxide gel characterization within a calcium acuminate cement paste by combined Pair Distribution Function and Rietveld analyses. Cuesta, Ana; Ichikawa, Rodrigo U.; Londono-Zuluaga, Diana; De la Torre, Angeles G.; Santacruz, Isabel; Turrillas, Xavier; Aranda, Miguel A. G. CEMENT AND CONCRETE RESEARCH.JUN 2017, 96, 1-12. DOI: 10.1016/j.cemconres.2017.02.025. The study analyses and characterizes the amorphous and nanocrystalline phase in cement-related samples with scattering data quantitatively analyzed by Pair Distribution Function and laboratory techniques to complemetn the sample characterization. Next we have a publication of 2D Materials and from researchers at Fundación IMDEA Nanocienca and ICMM in Madrid, ICMAB, ICN2 and the University of Manchester (UK). Anisotropic features in the electronic structure of the two-dimensional transition metal trichalcogenide TiS3: electron doping and plasmons. Silva-Guillen, J. A.; Canadell, E.; Ordejon, P.; Guinea, F.; Roldan, R. 2D MATERIALS. JUN 2017, 4, 2, 25085. DOi: 10.1088/2053-1583/aa6b92. This article is about 2D materials, TiS3 single-layers, whose properties may be change by injecting electron carriers. Finally, the last publication that we show is published in Physical Chemistry Chemical Physics, and by researchers at ICMAB, at Universitat Jaume I in Castelló and at Universidad Politécnica de Valencia. Enhanced conductivity of sodium versus lithium salts measured by impedance spectroscopy. Sodium cobaltacarboranes as electrolytes of choice. Fuentes, Isabel; Andrio, Andreu; Teixidor, Francesc; Vinas, Clara; Compan, Vicente. PHYSICAL CHEMISTRY CHEMICAL PHYSICS. JUN 21 2017, 19, 23, 15177-15186. DOI: 10.1039/c7cp02526b. The development of new types of ion conducting materials is one of the most important challenges in the field of energy. Lithium salt polymer electrolytes have been the most convenient, and thus the most widely used in the design of the new generation of batteries. However, in this work, we have observed that Na+ ions provide a higher conductivity, or at least a comparable conductivity to that of Li+ ions in the same basic material. This provides an excellent possibility to use Na+ ions in the design of a new generation of batteries, instead of lithium, to enhance conductivity and ensure wide supply. In July we have one article as the most cited one, and is published in Advanced Functional Materials, by the group of Marta Mas-Torrent. During the last decades, small molecule organic semiconductors have been successfully used as active layer in organic field-effect transistors (OFETs). In this work, the preparation of thin films is reported based on blends of an organic semiconductor and polystyrene by a solution shearing technique compatible with upscaling. It is demonstrated that the control of the thermodynamics and kinetics of the crystallization process is key for the device performance optimization. In August we also have one most cited article, which is published in the Journal of Chemical Technology and Biotechnology, and by researchers from University of Thessaly and Aristotle University of Thessaloniki in Greece, Freelancer in Santiago de Compostela, Pompeu Fabra University in Barcelona, Phillips University of Marburg and Institute of Physics in Germany, the Procédés, Matériaux et Energie Solaire, Centre National de la Recherche Scientiﬁque in Odeillo, France, and ICMAB. Over recent decades, there has been increasing global concern over public health impacts related to water pollution with arsenic. With the development of nanotechnology, nanomaterials are being proposed as alternative agents for water treatment. This study focuses on the use of core-shell nanoparticles as secondary receptors able to operate under intense conditions and perform efficient yet environmentally friendly regeneration of conventional adsorbents.